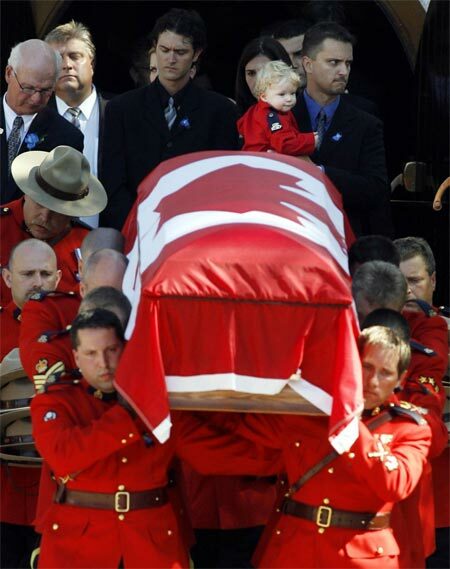 Nine-month-old Luca Bourdages is carried by a relative following funeral services for his father Royal Canadian Mounted Police Cst. Marc Bourdages at the RCMP Training Academy in Regina, Sask., Tuesday, July 25, 2006. Bourdages and Cst. Robin Cameron were fatally wounded following a high speed chase near Spiritwood, Sask., on July 7. Curtis Alfred Dagenais has been charged with two counts of murder and one count of attempted murder in the case.